I wish my parents had read more. Actually, that’s a pretty heartless thing to say given that my father came to this country as a Vietnam war refugee. With barely a word of English and with barely a cent in their pockets, my parents had larger problems on their minds than literature. But when you are the first generation son, who has discovered for himself that his future is in tracing books to their textual and cultural sources, how can you wish any differently? Today, the classics—the classics of all things—are made so cheaply, that they yellow or fall apart within a year. The most egregious case I’ve come across has to be the Gabler edition of Ulysses, an edition which purports to be authoritative, but whose integrity is undermined by its ramshackle construction. Ulysses is a literary liner that should have never ventured into the perilous waters of paperback fiction, but because it did, I have a poorly glued edition that sheds pages like a cat sheds hair. Fortunately, I found some time ago a 1960 edition by Modern Library. I want to say it was dedicated to a girl named Molly, but that would be stretching the truth. Wherever you are Mel, I have your book. Big Table 4, the Chicago based little magazine, featured the work of America’s avant-garde poets in the sixties: the Beats, the San Francisco Renaissance, the New York School, and the Black Mountain School. For every mark of ownership is depressing. I imagine something awful must have occurred for someone to sell their books, books that were expressly dedicated to them. What if I’m holding in my hands the article of a person who just died last week? Or what if that person, or perhaps their children, sold that book, with its loving dedication, to pay the rent? And then I get home and realize that that this book is something that will never belong to me, because I was not born into this culture of preserving and collecting and handing down books. This is how V.S. Naipaul must have felt before writing “A House for Mr. Biswas.” After living all his life in the homes of relatives and reading so many used books about this wonderful place called London, Mr. Biswas, who will never have the chance to see London, is so desperate to own his own home that he uses his life savings to build a home he doesn’t have enough money finish. The irony of the novel is that a tar paper home that you can call your own is a small victory nonetheless, though it be in poorer shape than his books. My online search for older editions of the classics, has produced mixed results. Reposted from a blog entry I wrote for an English course that I was TF’ing. In the introduction to The Beggar’s Opera, a beggar steps forward to say “he has not made my opera throughout unnatural like those in vogue; for I have no recitative.” What does he mean by this? Below is an excerpt from one of the more extreme examples of accompanied recitative, which is half way between recitative and aria, and accompanied by orchestra. It’s taken from Gay’s earlier libretto for Handel, Acis and Galatea. How does Handel convey each of the three verbs in the first example? What do you think English audiences might have found “unnatural” about recitative? Feel free to leave a comment. What is the musical equivalent of thieving? Contrafactum, and John Gay’s The Beggar’s Opera is a good example of it. Contrafactum is just a fancy word for taking a preexisting song on the public radar and supplying it with new lyrics (Weird Al does it too). By taking highbrow songs (or religious ones) and giving them lowbrow lyrics (and vice versa), librettists like Gay could create ironic relationships between the original and its echo. 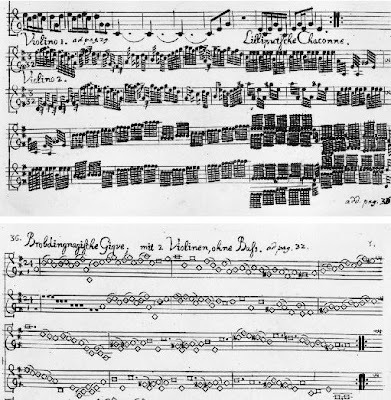 Below are some excerpts from The Beggar’s Opera and the sources from which Gay and his arranger, Johann Christoph Pepusch, cribbed. What do you think people found so funny? Feel free to share your response in the comments below. From Act I of the B.O. Never had hero so glorious a death. Rots, stinks, and dies, and is trod under feet. Two years after Gulliver’s Travels was published, it was set to music in Germany. Georg Philipp Telemann’s Gulliver Suite is one of twenty five “lessons” serialized in The Steadfast Music Teacher for the enjoyment of music makers at home. The suite, written for two violins, became an instant sensation. After all, who wouldn’t want to follow Gulliver on his exciting journey? Like Swift, Telemann was interested in the body human, and in particular, the body in movement. Swift’s satire gave Telemann the idea for a programmatic dance suite, each of whose movements imagines Swift’s characters in terms of musical gestures. Some short excerpts follow. More bold than stately, the opening procession sees Gulliver off on his voyage. The chaconne has music as sprightly as the little people it depicts. By contrast, the gigue imitates the clumsy steps of giants. Gigues are typically fast-moving dances. This one, not so much. The music of the Laputans is precious to the point of sleep-inducing, hence the title, reverie. The fifth and final dance, a loure, sets the civilized against the barbaric.” Can you guess which violin is which? Lastly, here is what score for the Lilliputian Chaconne and Brobdingnagian Gigue looks like. You don’t need to know how to read music to understand the visual joke being played here. Farewell Long Beach: The Queen Mary, from the gangplank. Probably one of the few times I rant about sports. 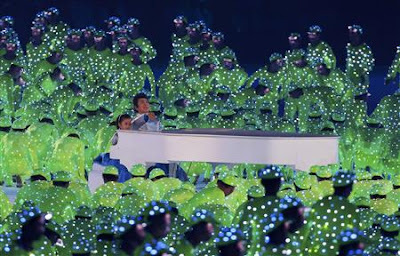 I can’t seem to get enough of the Olympics. It has completely derailed my schedule. I have no television, but the live streams on NBC’s website are irresistible. Whatever the network is unable to cram into four hours of airtime, it posts online. This means I can watch all the footage from sports most Americans don’t care about: handball, badminton, and trampoline (how can you not love trampoline?). The big story of these Games has been Michael Phelps. Apparently, NBC wrestled the IOC to hold swimming finals in the morning so that American viewers can see Phelps make history live at night. He has already captured five gold medals in these games alone and three more would put him above Mark Spitz for most number of gold medals won at a single games. But with NBC’s spotlight on Phelps, it’s easy to forget there are other sports besides swimming (and gymnastics). Some observations about these lesser appreciated sports. BADMINTON: The sport which Europeans invented Asians now dominate. You can feel all the rage against colonialism being released in the sharp smack of the shuttlecock. When played by pros, the game is as fast and exhilarating as tennis. At the Games in Beijing, badminton has drawn larger crowds than either swimming or gymnastics (the big ratings draws here in the states). China’s star player Lin Dan is apparently the equivalent of Kobe Bryant in the states. The American doubles team of Bach/Malaythong doesn’t stand a chance against the competition, but it’s nice to see them trying to create some American buzz for the sport. EQUESTRIAN: Not a sport for poorer countries. The cost of training must be enormous, and I’ve always wondered what the horses practice their leaps on—garden hedges? The hurdles this year tended towards the surreal. It was Dalí meets the Kentucky Derby. “A clean jump over the avocado,” I heard the commentator say, and sure enough, the fence was shaped like the fruit. This was followed by a wall of cheese. Pho-gettaboutit: Kids, don’t try this at home.